The enemy I was preparing to devour one tropical evening when the Bahamian sky was all sherbet clouds was a beauty. A regal stunner is famous for its peacock’s crown of feathery black-and-white spines. I looked down at my plate: So, finally we meet, you venomous, cruel beauty — you lionfish! Now, lionfish are not my enemy particularly, but they are the enemy of many people, places, and things. In their native waters — that is, in the seas around India, Indonesia, and Australia — they’re beautiful fish that people are happy to view. But during the latter part of the last century, they began turning up off the coast of Florida; by 2005 they’d invaded the Bahamas. 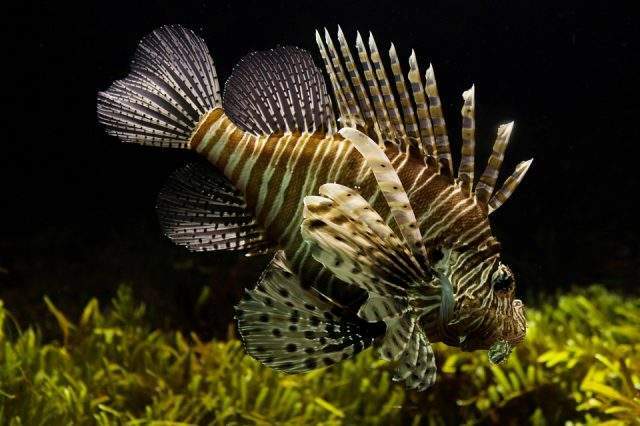 When lionfish invade a reef, they can reduce juvenile fish populations by nearly 90 percent in as little as five weeks. They present one of the greatest dangers to the Caribbean and western Atlantic waters. In short, this impressive resort on this fragile island is a place that attracts tourists who care about the environment, and a place where local employees can steer the economic might of the company toward improving their home. And that’s what they did when it came to lionfish.